Floors may not always be even so with the built-in levelers your piece will always look and function at its best even with an uneven surface below. Adjust the levelers on the base or legs to keep storage pieces from wobbling and its contents steady and secure. 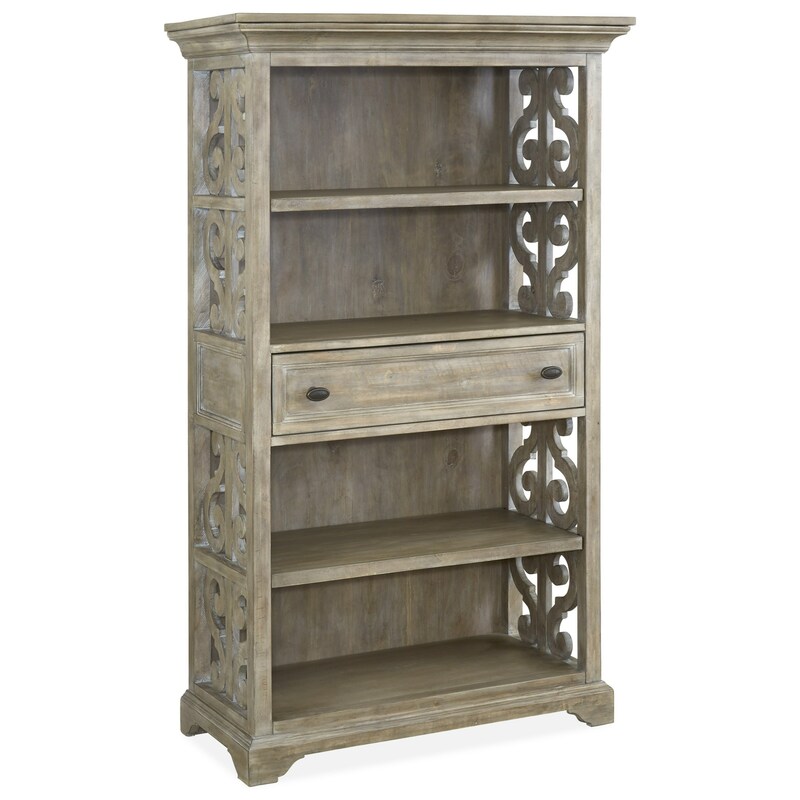 Details such as the fretwork along this bookcase's sides bring in its relaxed vintage style, and add an extra touch of elegance. It features two adjustable shelves, ensuring this piece will fit your exact storage needs. Great care has been given to the design of this bookcase, as even the drawer has been sealed for dust proofing. The Tinley Park Relaxed Vintage Bookcase with Adjustable Shelves by Magnussen Home at Miskelly Furniture in the Jackson, Pearl, Madison, Ridgeland, Flowood Mississippi area. Product availability may vary. Contact us for the most current availability on this product. Bring relaxed vintage style into your home with this collection. Inspired by the Gustavian style these pieces all possess a charming aesthetic, at home in many different styles. Metal accents throughout the collection help to create its unique, updated look. The Tinley Park collection is a great option if you are looking for Relaxed Vintage furniture in the Jackson, Pearl, Madison, Ridgeland, Flowood Mississippi area. Browse other items in the Tinley Park collection from Miskelly Furniture in the Jackson, Pearl, Madison, Ridgeland, Flowood Mississippi area.